In this mesmerizing thriller, Michael Stanley penetrates Africa’s exotic façade to share an authentic look at a modern land caught between tribal culture and globalism, colonial paternalism and independence; a beautiful and wild continent teeming with poachers, deadly diamond dealers, and the aftermath of apartheid. They found the first body—what the hyena didn’t ravage, that is—near a waterhole considered magical by the local bush people. A string of clues suggests that the victim was murdered and his identity hidden—a mysterious crime tailor made for Assistant Superintendent David Bengu, nicknamed Kubu—Setswana for hippopotamus. Though they look deceptively docile, hippo in the wild are deadly, trampling whatever lies between them and their objective. So it is with Kubu. On the surface the burly detective appears congenial; a convivial man with a sly sense of humor and a passion for his wife, his wine, and his classical music. 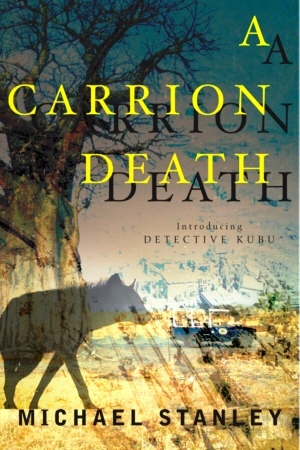 But Kubu is a clever and resourceful lawman determined to rid Botswana of crime and corruption. Michael Stanley is the writing team of native Africans Michael Sears and Stanley Trollip. The pair have had many adventures together, including tracking lions at night, fighting bush fires on the Savuti plains in northern Botswana, surviving a charging elephant, and losing their navigation maps while flying over the Kalahari. Sears lives in Johannesburg, South Africa. Stanley divides his time between South Africa and Minneapolis, MN.